COLOR(S):All white, gray, or black with white shading, mask or cap. 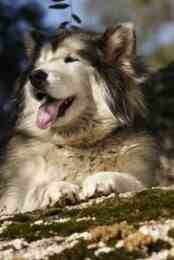 As the oldest of the Artic dogs, the Alaskan Malamute breed is large, strong and incredibly good looking. These powerful and well-built dogs have muscular, deep chests and are well suited for colder climates. Alaskan Malamutes have a wide head that features a proud expression. This breed is family oriented and does well with children who understand that this dog must be treated with kindness. Their very friendly nature and love of people does not make them an effective guard dog. Loyal, intelligent and affection, the Alaskan Malamute is a wonderful family addition, as long as you don’t reside in a hot and humid climate. Alaskan Malamute puppies and dogs are very friendly and good-natured, making them wonderful companions. This breed is usually good with children and strangers but can be difficult to train due to its stubborn nature. Alaskan Malamutes are strong-willed and self-assured so off-leash obedience training can be difficult. In comparison to most other dogs, Malamutes do enjoy howling and digging and should be supervised when around unfamiliar small animals due to their strong prey instinct. Alaskan Malamute puppies and dogs are prone to heavy shedding. Their thick, double coat features a course outer layer and a dense undercoat that averages one to three inches in length. Brushing is recommended at least twice a week. Alaskan Malamute puppies and dogs can have several health issues, particularly eye problems. This breed is also sensitive to hip dysplasia and chondrodysplasia. Not recommended for apartment life, Alaskan Malamute puppies and dogs require daily exercise and attention. These dogs are the happiest living outdoors but strongly desire companionship. An ideal environment for a Malamute features plenty of running space, such as in a large fenced in yard. It should also be noted that this breed should be kept cool when living in hot climates, providing them with ample shade and clean, cool water. To find the dog with the best temperament chose reputable Alaskan Malamute breeders when making a canine addition to your family. With all puppies and dogs, early obedience training is highly recommended to maintain a well-balanced dog.